Let’s start with the subjunctive: If I were in charge of party favors at the Oscars and the Golden Globes, I’d make sure every actor and director—every lover of movies and every maker of them—went home with a copy of Jon Thompson’s Landscape with Light. I’d tuck this book beneath every seat, beside every dinner plate. I’d ask the ushers to pass out copies at the door. Landscape with Light marries the literary sophistication of a consummate poet with the emotional investment of a devoted cinemaphile. The result is a collection of poems that both exceeds the basic meaning of ekphrasis (from the Greek for “description,” as in a work of art that describes another in some detail) and expands the definition to include “probe,” “rumination,” and “riff” as well as “epistle” and “homage.” Thompson ensures that no familiar viewer of these 54 classic and contemporary films, ranging from Birth of a Nation and The Wizard of Oz to Training Day, Fargo, and Grey Gardens, will ever encounter them the same way again. But let’s say, for the sake of argument, that you don’t know anything about movies at all. Let’s say you’ve never seen any of the films referenced in shy parentheses and set off in small italics beneath these titles. Would the reading experience be diminished without the viewing experience to correspond? I feel certain that it would not. What’s more: There is no correlation between my own favorite poems in this collection and the films I’ve seen and haven’t seen, the films I’ve loved and the films I’ve scorned. Thompson, in the spirit of Pound, makes absolutely everything new. And that’s another thing about Thompson’s masterful, multi-valent project: So many of the titles serve as prompts for poems yet to be written in addition to preludes to poems that already exist. I read this book at the beginning of summer term, concurrent with my Introduction to Creative Writing class. One day my students and I wrote our initial free-write to Thompson’s “Snow as Versions of Different Things.” I didn’t mention the ekphrastic nod to Fargo at first. I simply presented the title as invitation for each of us to create, explore, imagine. They like this idea. They like the idea that snow itself accumulates, layer upon layer, and the way this poem mimics quite naturally that natural enterprise, even comments upon it while doing it. They also like the way we anticipate many words for snow because of what is now an oft-referenced cliché about the Inuit language. “But we’re thinking ‘sleet’ and ‘freezing rain,’ not ‘desire’ and ‘death,’” one student remarks. Exactly! Near the end of summer term, my students and I tried another free-write generating in response to mother lines. I filled a bowl with poem titles from Thompson’s collection, once again omitting the movie subscripts. One student drew “A Panic That Dares Not Speak Its Own Name” (a poem which contains the inimitable line “Freeways that spaghetti the city,” an image so perfectly cinematic I feel as though I am peering at a screen and not a page as I read it...); another drew “Blue is the Color of Knowledge That’s Continually Unfolding” (a poem which begins with this pulsing question, keen and searching: “Where to put the regret,/ the loss?”); another drew “Brief Chronicle of Desire” (a poem which contains the mimetic marvel, “Moments in which nothing happens, just/ the slow recognition of the strangeness that’s overtaking your life”). Other beloved titles from the exercise include “From the Notebook of Disappointment,” “The Wilderness Beckons to the Self Unknown to the Self,” “American Dialogue,” “Fictions of the Ones You Love,” and “Cities Like We Thought They’d Be.” I’ve always believed that the best art invites the making of more art, and Thompson’s book has elevated this belief to personal credo. He responds to film in poetic form. Then, his poems gave rise to more poems and also to essays and stories in my class. One student mentioned his strong inclination to draw in response to the poem “Landscape with Emotion.” Another student wrote a short script in response to “B-Movie Drama” because she thought it called for dialogue. Of the titles lifted from that bowl, a rich assortment of films is represented, criss-crossing genre and era, “high” and “low” art. I want to entice you to read Thompson’s multi-faceted work without spoiling his many inspired pairings of title and film. To that end, I’ll simply riddle you here with the names of films that correspond to titles mentioned above. Can you pair them with their literary corollaries? Are you already beginning to write in your head? Where will you find poetry more declarative, urgent, or rare than here in this Landscape with Light? I have traveled widely in Poetry Land, deeply too. And I tell you: these poems are incomparable in what they do and in what they inspire us to do. Julie Marie Wade is the author of four collections of poetry and four collections of prose, including the forthcoming Catechism: A Love Story (Noctuary Press, 2016) and SIX: Poems (Red Hen Press, 2016), selected by C.D. 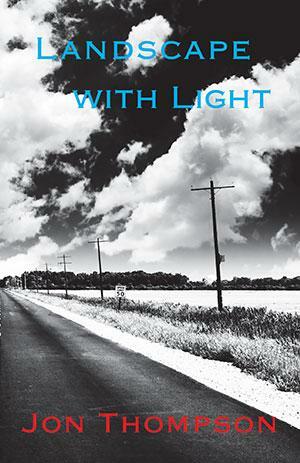 Wright as the winner of the AROHO/ To the Lighthouse Poetry Prize. A recipient of an Al Smith Individual Artist Fellowship, a grant from the Barbara Deming Memorial Fund, and the Lambda Literary Award for Lesbian Memoir, Wade teaches in the creative writing program at Florida International University in Miami. She is married to Angie Griffin and lives on Hollywood Beach.